Nikolić families are frequently Croats and they are mostly from Imotski area. According to some sources they are from Bosnian Posavina , less frequently Serbs, and Roms (from Bosnian Krajina Region). In the past century, relatively most of Croatian residents bearing this family name were born in Zagreb and in Bosanian Posavina (Brcko area). In places Borovica Gornja and Jelići in Middle Bosnia every second inhabitant had the family name Nikolić. About 6000 people with faimily name Nikolić live in Croatia today, in 2600 households. There were 3200 of them in the middle of the past century, and their number increased by 90 percent. They are located in all Croatian counties, in 108 cities and 450 other places, mostly in Zagreb (975), Split (395), Sisak (375), Slavonski Brod (195), and in Pula (175). At least 150 families with this surname emigrated from Croatia to: Germany (46), the United States (35), Austria (23), Switzerland (11), Canada (10), Australia (8), Sweden (6), France (5), the Netherlands (2), the United Kingdom (2), Argentina (1), and to South Africa (1). Family name Nikolić (including: Nikolic , Nikolich , Nicolich , Nicolic , Nickolich , Nikolics , Nikolych , Nickolic , Nikolitsch and Nickolick ) is present in 78 countries worldwide. The family name "Nikolic " is used by some 2000 people in Germany , about 1000 in the United States , and some 800 people in Austria. "Nikolich " is used by some 600 people in the United States , about 300 in Russian Federation , and some 90 people in Australia. "Nickolich " is used by some 100 people in the United States. 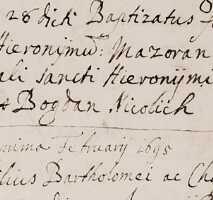 In the sources analysed in the project Acta Croatica so far, the name is mentioned over a hundred times, the first time 1689 in source Catholic Church Parish Records.